Ambler Cottage East, likes its twin Ambler Cottage, is one of a pair of adjacent cottages. Both are quiet, secluded, fully equipped 2 bedroom / 2 bathroom executive residences. 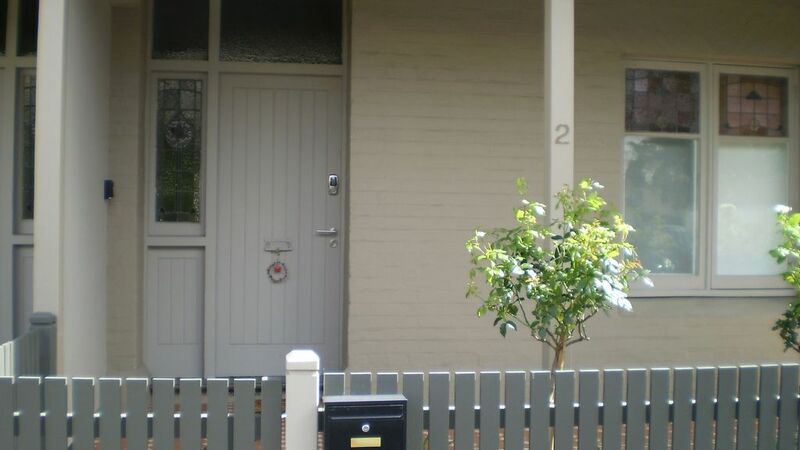 Located 150m from Adelaide’s South Parklands, in historic and tourist Unley, Ambler Cottage East captures the charm and convenience that only Adelaide can offer. Superbly renovated, Ambler Cottage East has polished karri and jarrah floors, fully tiled bathrooms, a well equipped kitchen and adjoining north facing open lounge. Full height windows and sliding door open onto a sheltered deck and secure private courtyard. Long term stays more than 10 days are available by special arrangement. Great location, comfortable and everything we needed. From the minute we arrived we loved the feeling of calm even though its was so close to the city. Was a lovely cottage with all the comforts of home. Comfortable, convenient - a real home from home! We thoroughly enjoyed our week's stay and wished it could have been longer. We really liked the large open plan living space with its well-equipped kitchen area and adjacent comfortable space - ideal for relaxing and having family over. Shops, restaurants and even the city are within walking distance. A truly delightful property and we look forward to a return visit. The cottage is lovely and very well appointed. It was great to have access to some food items as well. It was clean and bright. It was however VERY cold when we first got there and it took sometime to warm up. We suggest in the colder months that the heater be put on well before guests arrive. We had a fabulous stay. The cottage was very well equipped and incredibly comfortable. A very well equipped property so comfortable beautifully appointed and it’s location to the city was perfect. We look forward to our next stay. I can only echo the comments made by previous guests at Ambler East - this is a house I could easily live in myself. Close to supermarkets, shops and restaurants on Unley Road and King William Road, with easy access to the city. Everything you need for a comfortable stay - excellent kitchen with dishwasher, large fridge, coffee machine and other standard appliances. The presence of tea, coffee, sugar, milk and other condiments was a nice touch and much appreciated. Parking at the cottage is tight, particularly for SUVs or larger sedans, and especially if the neighbours park a little too close to the carport. All in all, a lovely place to stay. Thank you for your wonderful review Eleanor.